I have always embraced the bold in life. My home, my wardrobe, my language…all very colorful, all very bold. Like a bull in a china shop bold. This week the weather changed and we entered into a lovely humid mid-atlantic heatwave. My hair is out of control and my rosacea is redder than red. All I want to do is be naked, but that would not really be acceptable in polite society,actually it would be a horror show, so clothing it is. Heat + humidity = one hot mess of a menopausal woman. What’s a girl to do? After I pull my face out of the deep freezer, I check my closet and search for anything that is lightweight. I do not do denim after June 1, unless I am gardening, painting or any other major house project. It’s just too darn heavy to wear when the humidity is 97%. This morning, I found a handkerchief weight, sleeveless black top and paired it with a tube pencil skirt from BjouBjou to wear to Mass. The skirt has an elastic waist (every fluffy girls best friend) as well as a stained glass window pane print. Talk about BAM! Here be some bold color and pattern baby. I went a little crazy with the accessories. 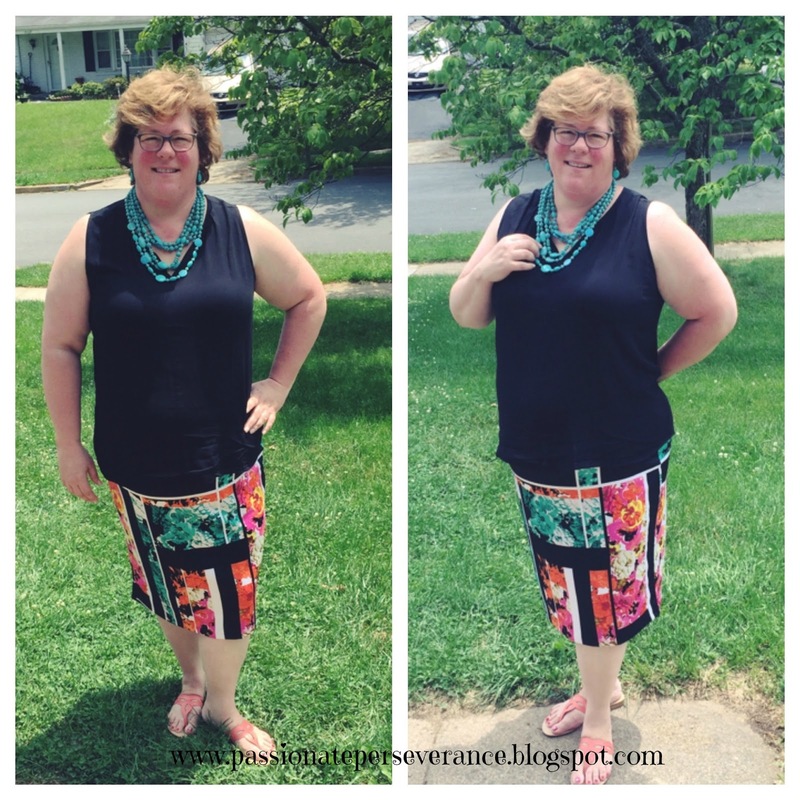 Turquoise necklace and orange sandals, both colors found in the skirt. It was light and comfy, just what I needed with the oppressive humidity today.Once again I am learning to love my upper arms…sort of, kind of, maybe. 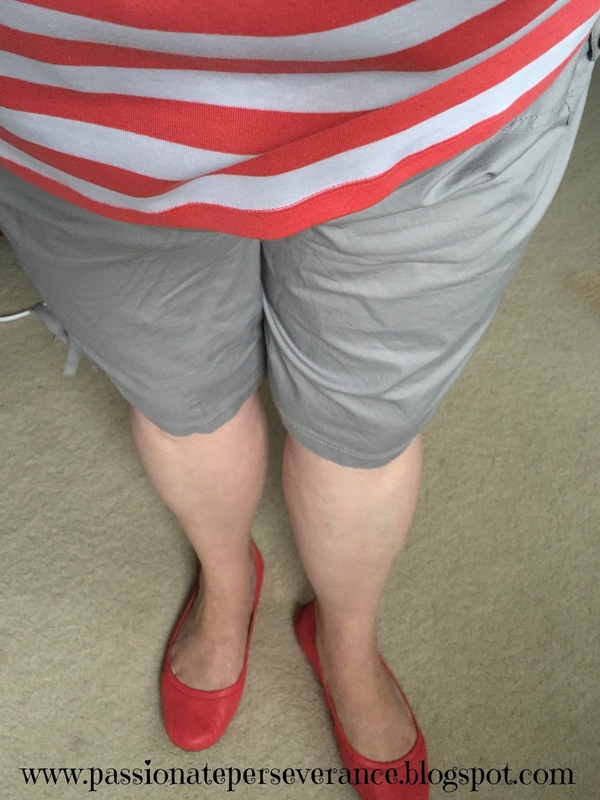 Earlier this week I wore a fabulous pair of “parachute” weight shorts form Dress Barn along with a cotton striped top, also Dress Barn. Grey is a neutral so you can really go crazy with color to bring the outfit to life a bit. Add a pair of colored flats and I am all set to go. I also wore a fabulously wonderful pair of hot pink cropped pants paired with a floral sleeveless tank bursting with color. The floral pattern reminded me of Courtney, so bright and happy. The pants were form JCPenney, Liz Claiborne brand I think. The top was a gift from a friend. It’s from Talbot’s. Then there were the white eyelet lace shorts and black tank. Bold can be interpreted many way. With bright colors or embracing classic color pairings, such as black and white. Simple, direct and clean. White is always a bold choice, especially if you’re around small children at all. Finally, we had family photos taken. I promise to share when I get them back. The dress I wore was a bright, bold coral color. The cap sleeved, princess seamed dress had a trumpet skirt which was cute and flirty. The photo below was taken on my iPhone. 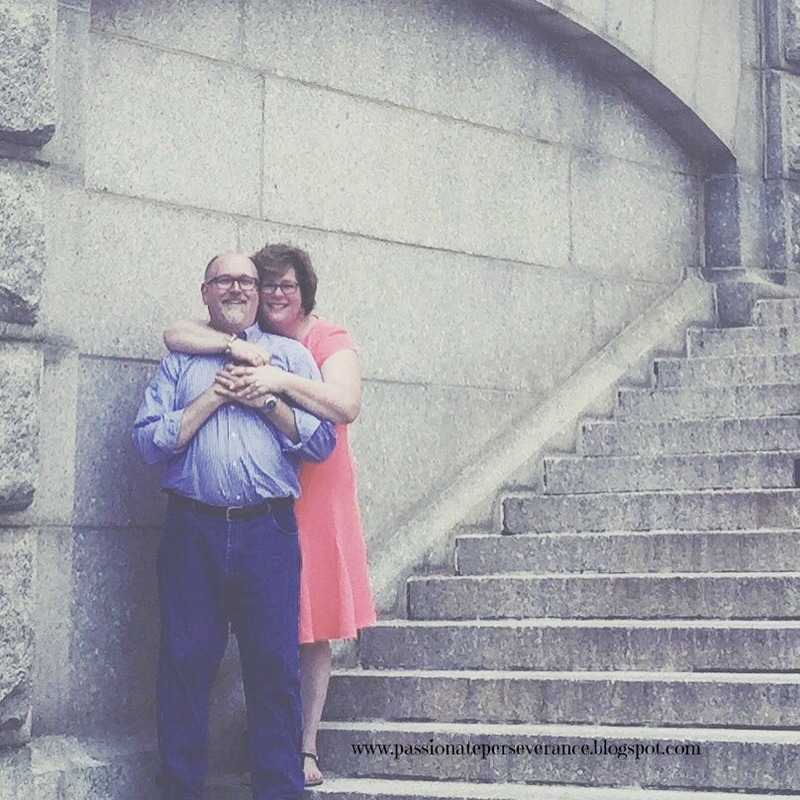 Jerry and I are standing in the same spot where we shared out first kiss 29 years ago. Oh what a night that was. Love truly is blind. It has been an adventure for sure, this love story of ours. But I wouldn’t have it any other way. Embrace the bold my friends. Life is filled with a rainbow of color. Love all the colour! Bold suits you, definitely! 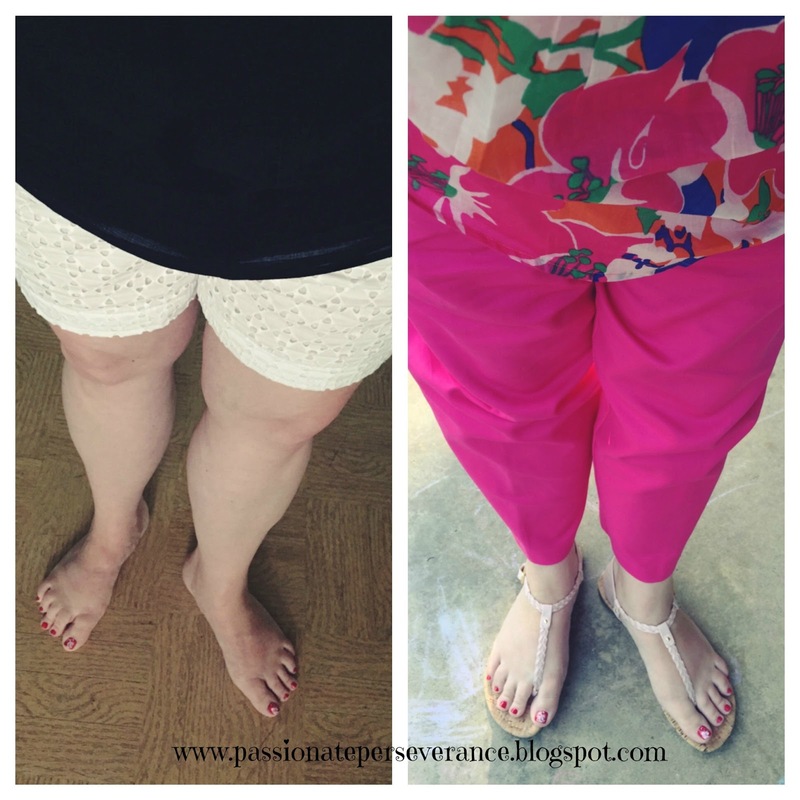 Thanks for the fashion inspiration, so nice to hear good fashion advice from a mom whose body looks a lot like mine. (BTW-I mean that in the best way possible.) Happy Sunday Mary! 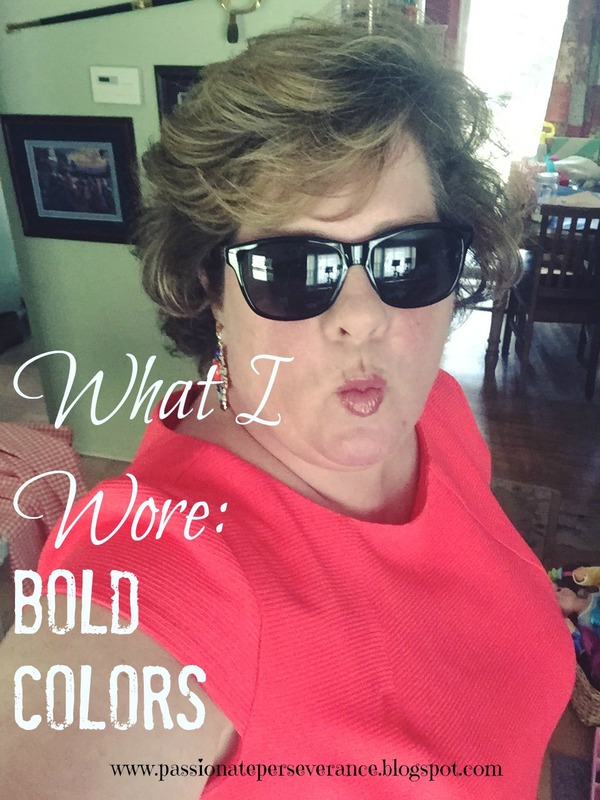 You definitely know how to work the bold color! These outfits all look great! And I just read the story of how you and Jerry met. Loved it! Looks great! Lovin' the bold! ….just starting to get a few bold pieces myself – no more drab…. I love your style! I find that I'm getting more bold as time goes by…bought a halter type top yesterday that requires a strapless bra. Woo hoo! !